Working with a reputable wholesale flower supplier not only means you have access to stunning fresh flowers but you have access to a whole wealth of knowledge, including what flowers go best for what occasion. For years it has been known that particular coloured flowers are often chosen for certain occasions. Knowing what colours are appropriate for your customer’s needs can be tricky when you are dealing with so many different flower varieties. The team at Flower Flow have put together a quick and easy guide to flower colours and their meanings. Red flowers often represent love, desire and strength. Red flowers have long been a symbol of love with the colour managing to easily stand out amongst other flowers. Red roses are often chosen as a gift to give to loved ones. Not only used to show love, red flowers can also be used to convey respect and courage. Similar to red flowers, pink flowers are used to show love, happiness and gentleness. The pink colour is also used to symbolise femininity which is why you often see pink flowers in bouquets made up for customers looking for Mothers Day bouquets. Yellow flowers are a symbol of friendship as their bright cheery colour is used to help brighten someones day and help increase positivity. It is also said that yellow flowers help to evoke feelings of joy. Yellow flowers are also said to symbolise success and pride. White flowers are extremely versatile and can be used in bridal bouquets or bereavement arrangements. White roses are a favourite in these kinds of bouquets as no other flower can symbolise purity during a wedding ceremony or sympathy during a memorial service quite like a white rose. Also known as a symbol of royalty and ceremony, purple flowers are a sign of success, dignity and pride. With so many different shades of purple available, a bouquet of purple flowers can really create depth and texture while looking amazing. Not to be confused with purple flowers, lavender flowers symbolise elegance, grace and youth. While some people may consider lavender coloured flowers to be old-fashioned, when built into the perfect bouquet lavender flowers can look stunning and stand out as the hero flower. Blue flowers are said to be soothing and evoke feelings of relaxation in order to release negative feelings and stress. Arrangements containing blue flowers are also said to cool anxiousness and bring an overall sense of calmness. Used to wish the receiver good health and good fortune, green flowers can also be a symbol of youthfulness. Not always a top choice, green flowers should not be underestimated as an arrangement that showcases green flowers can stand out just as much as other colours. Ensuring you have plenty of stock available to your customers is essential in order to provide stunning bouquets for all occasions. 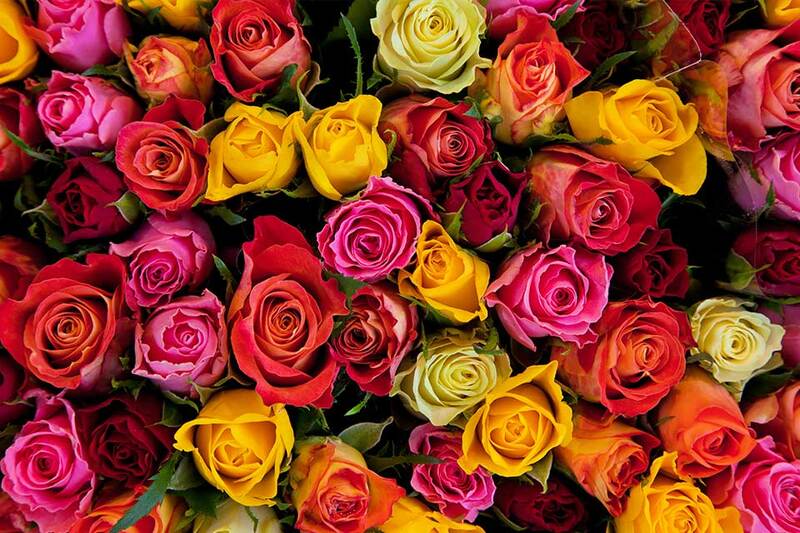 Speak to Flower Flow today to see how we can help keep you stocked with superior fresh flower colours all year round.